The earliest monuments in the church are the 9th-century Anglo-Saxon stones displayed in the Savile Chapel, most are fragments of crosses, four with inscriptions. In the Savile Chapel are also several important tombs. An effigy of a knight in chain mail, thought to be Sir John de Thornhill (d. 1322). An alabaster tomb chest with eighteen 'weepers' (small kneeling figures) around it and effigies thought to represent Sir John Savile (d. 1481) and his wife. 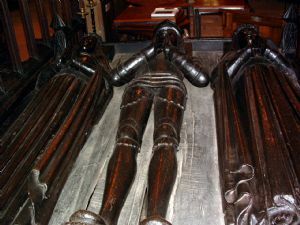 An oak tomb-chest set up in 1529 to commemorate alater Sir John (d. 1504) and his two wives. The tomb of Sir George Savile (d. 1614) and his wife Anne, marked by a massive Renaissance monument. An alabaster effigy of a later Sir George (d. 1622) carved by the famous sculptor Maximilan Colt. A monument to Sir George Savile of Rufford (d. 1743). Also displayed in the Savile Chapel are three earlier medieval cross slabs found in 1990 when the monument of the earlier Sir John was dismantled for conservation. Two show pairs of shears, a common female emblem, and a third a pair of scissors, perhaps denoting a tailor. A huge programme of conservation, cleaning and restoration is now complete (January 2015). Acknowledgment to WY Archives Services’ History of the church for much of this text. The Army did not stick to the coasts, but went inland and roamed about, exacting tribute as it went (or ‘making peace’, as the chroniclers described it), which means the Army would promise not to attack if the people paid a considerable sum, and sometimes attack anyway even after the money had been paid. They first went north to York, ending a civil war between two contenders for the Northumbrian throne by killing both and taking control themselves. In 869, the Army went to East Anglia, killed king Edmund (and thus made him a saint), and used the area as a base from which to start a series of attacks on Wessex. In 871 they were joined by a ‘Great Summer Army’ which came over from the Continent, and they continued to harass Wessex and Mercia in the next few years. GEORGE EDMUND STREET was born at Woodford in Essex on the 20th of June 1824. He was the third son of Thomas Street, solicitor, by his second wife, Mary Anne Miliington. George went to school at Mitcham in about 1830, and later to the Camberwell collegiate school, which he left in 1839. For a few months he was in his father's business in Philpot Lane, but on his father's death he went to live with his mother and sister at Exeter. There his thoughts first turned to architecture, and in 1841 his mother obtained a place for him as pupil in the office of Mr Owen Carter at Winchester. Afterwards he worked for five years as an improver with Sir George Gilbert Scott in London. At an early age Street became deeply interested in the principles of Gothic architecture, and devoted an unsparing amount of time and labour to studying and sketching the finest examples of medieval buildings in England and on the Continent. His first commission was for the designing of Biscoray Church, Cornwall. In 1849 he took an office of his own. He was a draughtsman of a very high order; his sketches are masterpieces of spirit and brilliant touch. In 1855 he published a very careful and well illustrated work on The Brick and Marble Architecture in the Middle Ages – notes of a tour of Italy, and in 1869 Some Accounts of Gothic Architecture of Spain, with very beautiful drawings by his own hand. Streets personal taste led him in most cases to select for his design the I3th century Gothic of England or France, his knowledge of which was very great, especially in the skilful use of rich mouldings. By far the majority of the buildings erected by him were for ecclesiastical uses, the chief being the convent of East Grinstead, the theological college at Cuddesden and a very large number of churches, such as St Philip and St James at Oxford, St Johns at Torquay, All Saints at Clifton, St Saviours at Eastbourne, St Margaret’s at Liverpool and St Mary Magdalene, Paddington. His largest works were the nave of Bristol Cathedral, the choir of the cathedral of Christ Church in Dublin, and, above all, the new courts of justice in London. The competition for this was prolonged and much diversity of opinion was expressed. Thus, the judges wanted Street to make the exterior arrangements and Barry the interior, while a special committee of lawyers recommended the designs of Alfred Waterhouse. In June 1868, however, Street was appointed sole architect; but the building was not complete at the time of his death in December 1881. Street was elected an associate of the Royal Academy in 1866, and RA in 1871; at the time of his death he was professor of architecture to the Royal Academy, where he had delivered a very interesting course of lectures on the development of medieval architecture. He was also president of the Royal Institute of British Architects, a member of the Royal Academy of Vienna, and in 1878, in reward for drawings sent to the Paris Exhibition, he was made a knight of the Legion of Honour. Street was twice married, first on the 17th of June 1852 to Mariquita, second daughter of Robert Proctor, who died in 1874, and secondly on the 11th of January 1876 to Jessie second daughter of William Holland, who died in the same year. The architects own death, on the 18th of December 1881, was hastened by overwork and professional worries connected with the erection of the law courts. He was buried on the 29th December 1881 in the nave of Westminster Abbey. It was his philosophy that an architect’s personal style was synonymous with his moral dignity. He believed he was a privileged servant of Almighty God, who had entrusted him with an individuality, the due expression of which was part of the Divine Plan. Early influences nurtured his love of medieval Gothic and the High Church. His religion was a necessity to him and he served God as a devout High Anglican. In these days of railways and rapid travelling there is scarcely any excuse for stopping quietly at home. The most busy man finds some short holiday in the course of the year, and, if wise as well as busy, spends it not in quiet sojourn at some watering-place, but in active search of the picturesque, the beautiful, or the old, in nature or in art, either at home or abroad.